Robots are doing all kinds of remarkable things nowadays it seems: competing in skiing, therapeutically hugging humans, monitoring crops so that we don’t starve, and of course, performing crazy stunts. But what if these robots had to perform all these tasks without their ability to see, effectively operating “blind”? The idea here is to create a robot that doesn’t need a camera and sensors to find its way around uncertain terrain — because as powerful as the technology can be, we know that computer vision can easily be fooled. This third version of the Cheetah is a step up from its forerunner, displaying a greater range of motion that permits it to stretch forward and backward and twist from side to side, much like its big cat namesake. It’s also capable of walking on three legs instead of four, in addition to having a really cool move called a “pronk” — a bounding leap that is similar to that of a gazelle. All this enables the Cheetah 3 to handle different terrains such as stairs and curbs, as well as more uneven and potentially dangerous terrain that might be present in disaster zones. In addition to these abilities, the bot is equipped with two new algorithms that help it to regain balance if it steps on debris or is unexpectedly pushed. The first is a contact detection algorithm, which helps its each one of its legs figure out when is the best moment to step on the ground, versus switching its movement to swing it in the air if it steps on something unanticipated — such as a surface randomly littered with rocks — helping it to keep it steady. Data gleaned a variety of sensors that track the positioning of the legs in space relative to its body, which is then computed to determine the probabilities of the leg touching down on the ground, the force created, and the chance that the leg will still be in the middle of its swinging motion. All this helps the Cheetah 3 decide how to best keep its balance as it moves without the benefit of sight, much like how we would if we had to walk across a darkened room. The model-predictive control algorithm works in conjunction with the contact detection algorithm by working out possible future positions for the body and each of the legs every 50 milliseconds. This offers the robot a chance to react quickly if it encounters an unfriendly shove and allows it to produce an appropriate counterforce — not too much, not too little, but enough so that it won’t fall down. 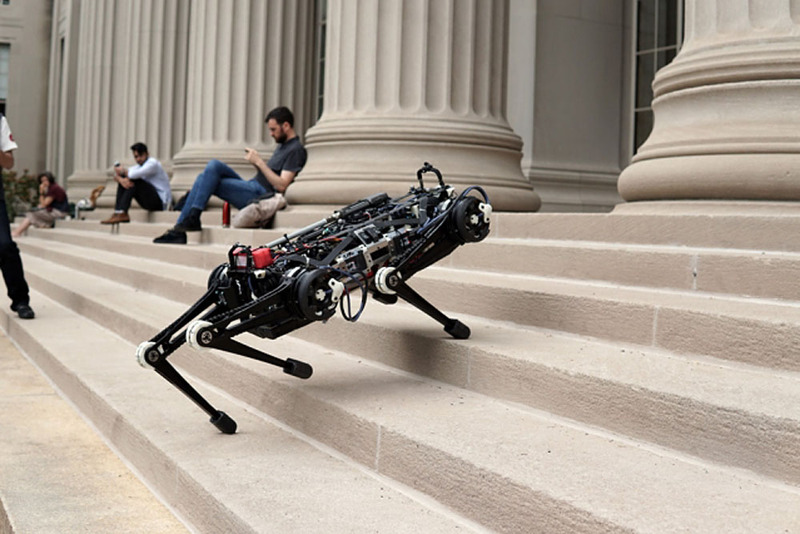 But the robot won’t be blind forever: the team aims to develop the Cheetah’s blind locomotion to the point that when it is ultimately combined with other cameras and sensors, it will be agile and sure of itself as it moves through hazardous situations.